Getting the updated site ready for the 2nd Edition launch. What WordCamp Speaker is the Best? Help choose the best WordCamp speaker! If you’re at all a fan of microblogging, you’ve probably seen some 140-character disasters come sailing through your stream. I’m not talking about faux-pas or inappropriate missives; my real peeve is using microblogging as a relay service for whatever content you actually do update. Am I suggesting that you should never tweet about sales, blog posts or links to other sites? Not at all! Those are all perfectly legitimate uses of a microblog, and can be a powerful tool for bringing a new audience to your content. The difference between an unexplained URL and a quick note (“Today I’m talking about gluten!”) followed by a link: huge. One of them is practically bound to be ignored (didn’t your mama teach you never to follow strange links? ); the other lets people know at a glance where you’re sending them and why they should click. But don’t think that you can just paste that same note and URL combo everywhere you have an online presence. Remember, some of your fans may follow you in multiple places. If all you’re doing is regurgitating the same tired message, all you’re really saying to your fans is that there’s no point in paying attention to more than one of your feeds. That can be a real problem if you ever do decide to run specials or connect with your followers in a meaningful way – once they’re gone, it’s unlikely they’ll be back. Stats can be a great way to keep tabs on how much traffic your site it getting, but remember to take them with a grain of salt. Different tracking programs register hits in different ways. For example, WordPress.com stats (like the ones I have on this very site) will very helpfully tell you that they don’t count your own visits to your site in your total daily views…but if you’re checking your site from a different browser (or a different device, like your iPad) then all those obsessive clicks to see if your comment count has updated will cause your view count to soar to the stratosphere. Some stats programs can be configured to ignore all views from your IP address, which can take care of the multiple browsers/devices problem…but if you take a look at some of your site visitors you may notice things called bots or spiders. Those are search engines crawling your site, and they are extremely unlikely to comment to tell you how brilliant you are. Being largely composed of algorithms, bots and spiders just want to make sure your content is relevant. Apostrophes mean well. They show possession, join together two words into a new conjunction, and (in some very specific cases) indicate plurals. But that’s their whole problem. The apostrophe, it wants too much. Not content to simply show ownership, the apostrophe creeps into words in which it simply does not belong. It’s the clingy ex hell-bent on showing that you cannot possibly live without it. Take, for example, the classic its/it’s issue. Usage should be simple: use its when you’re talking about something belonging to it, and use it’s when you’re trying to say it is. But that pesky apostrophe can trip you up. Looking at its, you think that’s not right. If it were Bob’s, there would be an apostrophe before the s. I must mean to use it’s instead. And the apostrophe nods and insinuates itself between the t and the s, despite the fact that it has no business being there at all. Keep your eye out for the apostrophe. It’s possessive. One of the great things about WordPress is the ease with which you can create pretty, semantic URLs. But did you know that some permalink structures can potentially negatively affect your site’s performance? If there isn’t some way to narrow down the information in the URL and map it to a specific page or post, the system must perform a lot of database searches to find the correct entry. His article went on to cite examples of permalink structures which required extra database searches…which included our standby of /%category%/%postname%/. Apparently, since %category% outputs a text field, it takes more time for WordPress to distinguish your post from a page – which requires WordPress to store extra information in its database to compensate. For performance reasons, it is not a good idea to start your permalink structure with the category, tag, author, or postname fields. We’re using /%year%/%postname%/ as our default from here on out – how about you? Not so anymore! The Link dialog in the Edit screen has been re-vamped; now, when you click the little chain-link icon in your editor, you’ll see a searchable list of all your posts and pages. Choose the one you want and it automatically populates the link information (as well as giving you the option of opening the link in a new page). Note: this only works in the visual editor. Sadface for people like me, who live in HTML view. The Admin Bar: Taking its cue from WordPress.com, this update gives logged in users an admin bar at the top of their site, giving quick information on and access to comments, updates, stats and shortlinks. 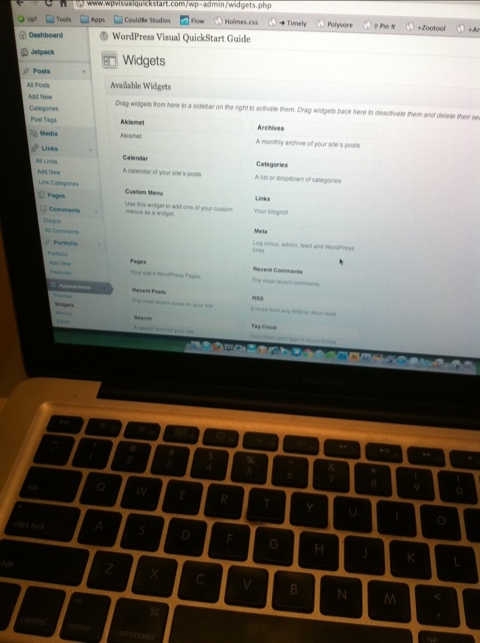 It also lets you quickly edit your page or add a new post without opening a new tab. Haters can disable the Admin Bar in your Profile options. Introducing Post Formats: WordPress exhibits some Tumblr envy with the debut of Post Formats, which allow theme developers to bake in special styling for different types of posts. Enhanced CMS capabilities: Ever wanted a special archive for a custom post type? Now you can have one. There’s also support for advanced taxonomy and custom fields queries. 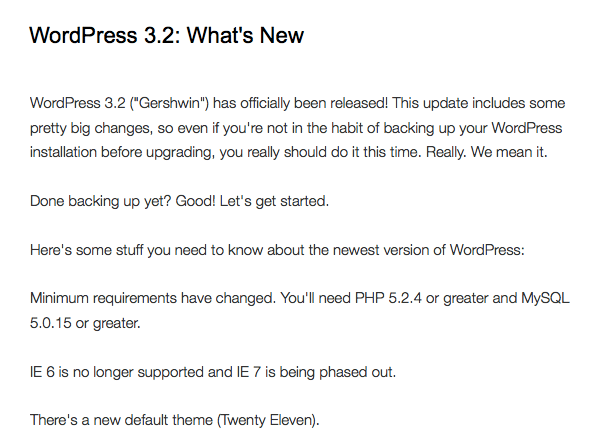 Our little WordPress is growing up so fast! *wipes tear* Check back soon for new tutorials and more info. Want to add a custom background that you can switch out whenever you want? Tired of your old header? Want to switch it for something fresh and new? 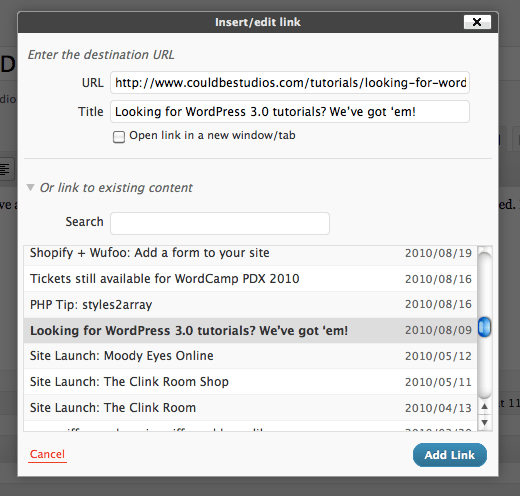 WordPress 3.0 makes it easy. You just need to make a few changes to your functions.php and header.php files, and then you can switch headers as often as you want. You’ll need FTP access to your site’s theme files (you can do some of this in the Appearance Editor, but it’s easiest if you can upload and download as necessary). You’ll also need to know the height, width, and location of your current or desired header, and you’ll need an image or graphic to use for your new header. Make sure you change the dimensions to match the size of the header on your actual site. Note that you will also need to upload a default header to your theme’s image directory (if you wish to use your existing header as the default, make sure you change the Header Image name in the function). Change the alt text to reflect your image or site. Log in to your WordPress admin screen and click “Appearance.” You will now see a link called Header. Click that to access your Custom Header section. You’ll see your default or current header as well as instructions for uploading a new one. You can also revert to your default header or eliminate your header altogether (note that there is no undo for those options, so choose carefully). To upload a new header, browse for the image or graphic that you want to use (make sure it is at least as wide and high as your specified header dimensions) and click ‘Upload.’ If you need to crop your image, you can do so in the next step. Move the bounding box around until you are happy with the new header image and click Crop & Save. That’s it! Your new header image will appear on your site, and you can switch it out as frequently as you like. Questions? Problems? Leave a comment and we’ll do our best to help you out. Proudly powered by WordPress Theme: Our Theme.